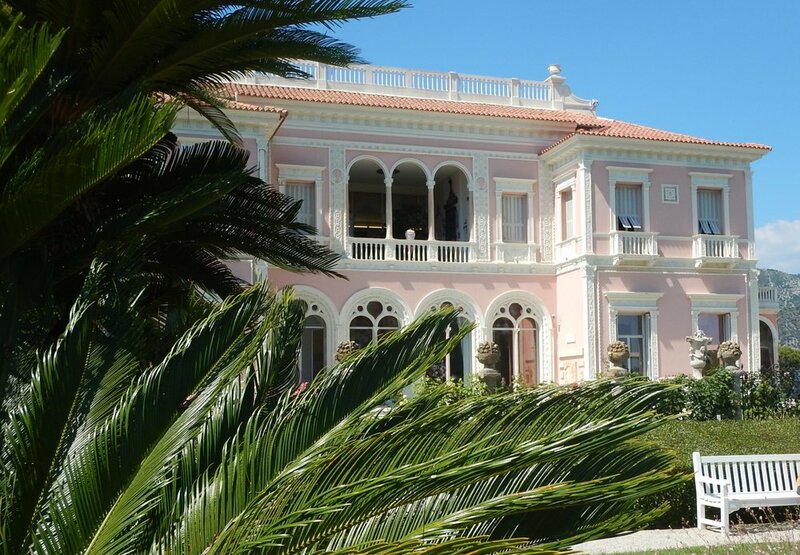 Perched on top of a ridge between Nice and Monaco is the pink residence of Baroness Beatrice Ephrussi de Rothschild. Built in the 1880's, it reeks of luxury in an understated way. The home, painted pink as are all the flowering plants, has a central courtyard and a clever roof design that makes you think it's open air. The rooms are huge and decorated with an amazing art collection. Ceramics and furniture too. The Baroness was well travelled, seemed to have an unlimited budget and a tasteful eye for art and home furnishings. wearing my pink dress, and pink soxy beast sox. Completely a coincidence. Her home took ten years to build, and it's beautiful. Parking doesn't allow for coaches, so visiting numbers are modest and it's very peaceful wandering around the villa and superbe gardens. Even the marble columns are pink. Part of the formal gardens from the upstairs window. The fountains dance to classical music, softly and gently. a door knocker for my walking buddies who have done or plan to do the Camino Trail. The view over the Mediteranean, understated! the ceiling in one of the dining rooms. Well kept Rose garden on the south side of the ridge. There are 7 different garden rooms. All beautiful.